Everyone uses support software, from software companies to ecommerce sites. Yet most businesses don’t want a one-size-fits-all solution — they just want software that’s right for their needs. If you’re a broke startup, the search for the right help desk software can be even more complex and overwhelming. I should know, because I ran a small business. Once upon a time I had only one (or sometimes two) people taking care of support. We depended on Gmail, using different labels to avoid collisions and marking messages that needed urgent attention with a star. Genius, right? There was no way to check whether customers were getting their answers in a timely manner (or at all). There was no way to track responses or which agents were handling these responses, and no one knew what had happened when things went wrong. Most importantly, there was no way to work together — oftentimes the most appropriate answer emerged way after the “Send” button had been clicked. Due to these concerns, we were pressured into addressing our problem sooner rather than later. But as we started our quest for support software, we found we were in for a few surprises. 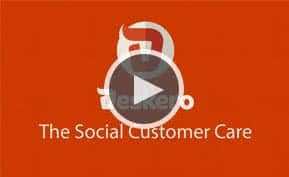 Looking around the websites of enterprise-level help desk solutions, we realized that most software providers allow people to sign up and use a free trial (usually with high-value features enabled). Unfortunately, this “carrot-and-stick” approach to trial versions applies to the entire SaaS industry. By starting users off in premium plans, help desk vendors proceed to hook clients onto their features before taking the carrot away. When the trial version expires, so does the functionality of the account, prompting users to pony up the cash to retrieve those features. We found that as a SaaS vendor becomes successful, its offerings get priced out into the stratosphere. Before you know it, the premium plan you’ve been sitting on suddenly becomes “lite” and you start feeling the short end of the stick. There’s a growing discontent with this approach among small business owners, since SMBs have less resources to match (or exceed) the support quality of their larger counterparts. Most one-man businesses are looking to start off on many free plans simultaneously, slowly easing into the one that works for them. And a 15- or even 30-day trial may not be enough to do that. Instead, small businesses need a free, bare-bones plan to ease into the system. If their business grows, so can their plan. Indeed, there are many vendors with plans that offer a combination of lower-level features for free. This way, small businesses can use free support software that never expires. Below I discuss eight free help desk software solutions ideal for startups and growing businesses. For the purpose of this post, I’ll focus on three agents, because that’s the extent of support most small businesses need. These businesses can’t afford to splurge on support software, or worse yet, spend weeks teaching others how to use it. Below I’ve compiled a quick review of each support solution listed in the above table. Of course, since I was only able to shoot off a bunch of emails, set some tags and create a few knowledge base articles, I may have missed other defining features (mobile functionality, for instance). Has notifications for new messages, but you must upgrade to reply to them. Pros: If you like easy-to-read buttons and a clean interface, you’ll like Casengo. Customer information is visible on the left and ticket properties (labels and common replies) can be called up on the right. You can preview tickets beforehand and receive real-time notifications of new tickets. 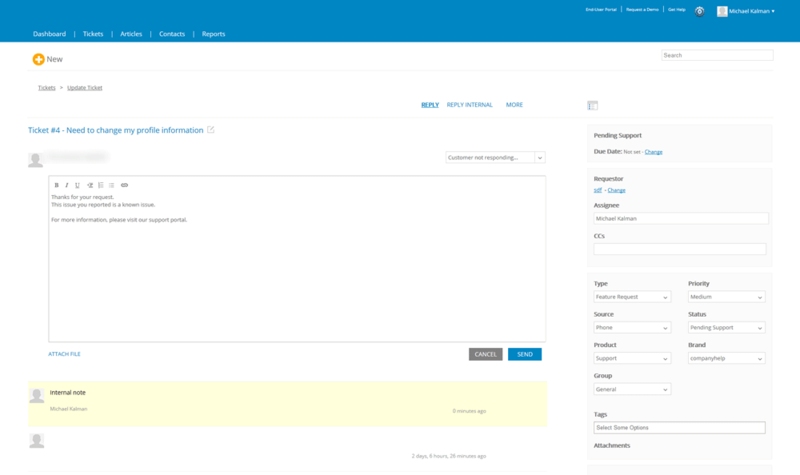 There’s also an ability to add private notes, log calls to customers and add custom labels from a drop-down search. Cons: I wasn’t a big fan of the knowledge base articles. Casengo only allows plain text articles with no formatting or images. Another negative element is that the so-called free plan seems unusable; it has a 30-ticket limit and you are not allowed to reply to tickets. In Short: Casengo’s free plan is quite limited when stacked against its competitors, and that really detracts from considering it as a serious alternative. To be fair, I didn’t have a chance to test the chat function, so I can’t write off the platform just yet. Clean interface, but the software itself leaves a lot to be desired. Pros: Cayzu has a handsome interface and a wide offering of integrations (14 in total) that include social media and other CRM solutions. I like the ability to rate articles with stars instead of just hitting “useful” or “not useful.” I also like the to-do list in the dashboard, which is visible while seeing all recent activity. Cons: Whenever I clicked on the “tickets” tab in the header, I kept getting a 404 error. This defeats the purpose of some features (such as merging tickets) if I can’t even see those tickets. I also found that there was no simple way to downgrade to a free plan; the account page gives no indication of this ability, so I assume you must contact support for this. In Short: It seems like the Cayzu developers didn’t finish their product all the way, which is a little disappointing, since the software looks like it could give the competition a run for their money. Color-coded menu on the left is helpful, but it does not update in real time. Pros: The ClickDesk admin panel is very simple and straightforward, and the ticketing interface is color-coded and easy to read. I liked the option to add filters and make them visible to specific departments. Although the chat window looks a bit busy to the end user, it’s a powerful function that lets you set proactive chat rules to fire preset messages. I also like how you can add your social media accounts into the chat itself. Cons: What I don’t like is the lack of real-time updates of tickets (you must hit refresh). This may slow you down if your workloads get heavy. Another minus is that there’s no knowledge base, not even in the premium plans. I also wasn’t able to set plain-text emails, which was frustrating. In Short: If I needed a chat and help desk platform, this solution would fit my needs perfectly. I would recommend it for small businesses that don’t have a need for knowledge management. A very well-thought-out ticketing system, but all of the features take some time getting used to. Pros: Freshdesk has a lot of features built into the free plan, including the ability to merge tickets, set views and play with an extensive set of case rules often found in premium plans. There are bonuses such as custom ticket fields and the ability to set customers and their companies, for example. I like the to-do list in the dashboard, and there’s also a basic reporting feature. Cons: This platform is too difficult to start using right away, with many buttons, options and settings. I didn’t like that users can’t comment on knowledge base articles. Additionally, the idea community and agent gamification functions — both well-advertised features — are not available on the free plan. 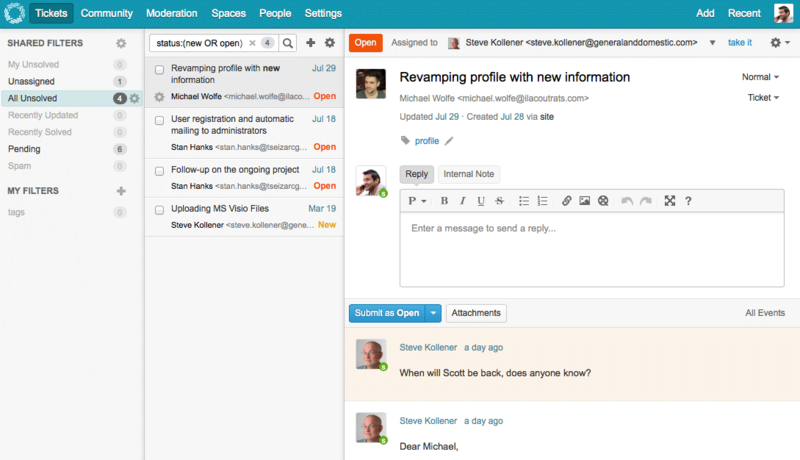 In Short: Freshdesk is a great support software to start with. I would recommend it for businesses that want a powerful help desk to grow with their company, but only want to pay for what they use. Freshdesk day passes are a great example of this capability. A Twitter-inspired interface that is very clean and takes little time to get used to. Pros: Reading tickets on Groove is easy, since the tickets don’t spread across the entire page. And though we’re talking about free plans, Groove’s paid plan features social media integrations and a mobile-friendly help desk — worth noting if you are interested in those capabilities. Cons: The free plan is quite limited, and it does not include a knowledge base. You’re also limited to 250 tickets and two agents, which is clearly not going to work once your ticket numbers pile up. In Short: Until recently Groove was a paid-only service; they’ve only just begun offering a free plan, and it shows. In my opinion, there need to be more features in the free plan for Groove to remain competitive in this arena. 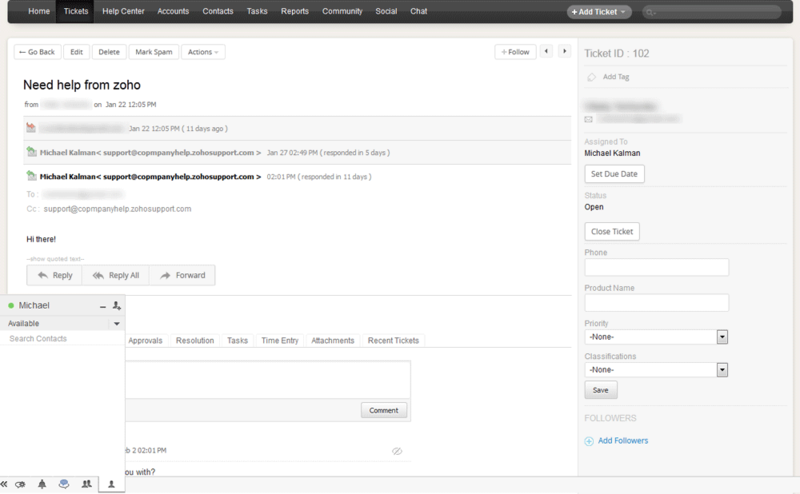 Includes functions for tickets, community, moderation, spaces, people and settings in the admin panel. Pro: Helprace offers a comprehensive ticketing system, knowledge management and a full-fledged community, all of which are accessible in the admin panel. The solution’s selling point is its community: users are able to ask a question, submit an idea, report a problem or give praise instead of sending off private support requests. The user portal also looks great on mobile devices. Cons: Many businesses may be looking for integrations or some sort of reporting feature from their help desk dashboard. The ability to pull from Twitter mentions or Facebook comments would also be welcomed. 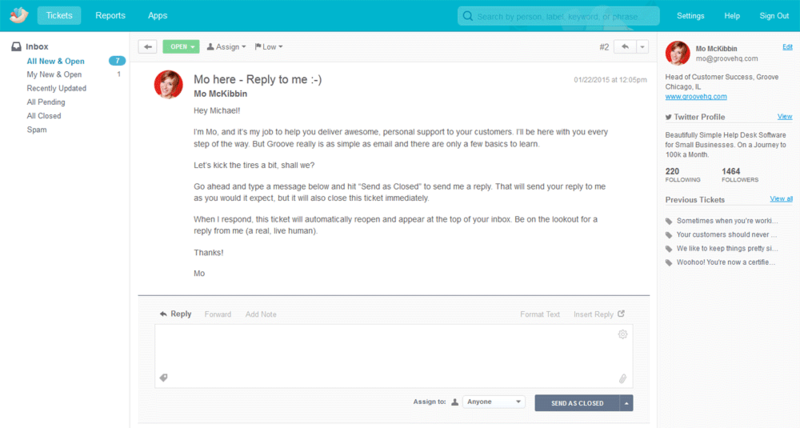 In Short: If you’re looking to collect feedback from your users and manage requests with a complete ticketing system, Helprace is a great choice. I recommend it for its ability to combine all of your support needs in one clean package. The ticketing interface is minimalistic, but the drop-down icons at the top add an extra step. Pros: Help Scout includes a lot of integrations. The one that sticks out is the ability to track phone calls with voicemail. I also like the redirect options when submitting tickets, as you can go through tickets very quickly this way. Additionally, keyboard shortcuts have the ability to increase agent productivity dramatically. Cons: Help Scout Docs (the platform’s knowledge base) is a separate add-on for the paid plan. The free plan itself is limiting, without workflows or a dashboard. The limitations are a little discouraging, since other vendors fit many more features into their free plans. In Short: The free plan gives you three users, one mailbox and a simple help desk. This allows you to offer basic support with just enough tools to keep support gears running smoothly. I would recommend Help Scout due to the clear advantage of using a platform that functions like normal email. 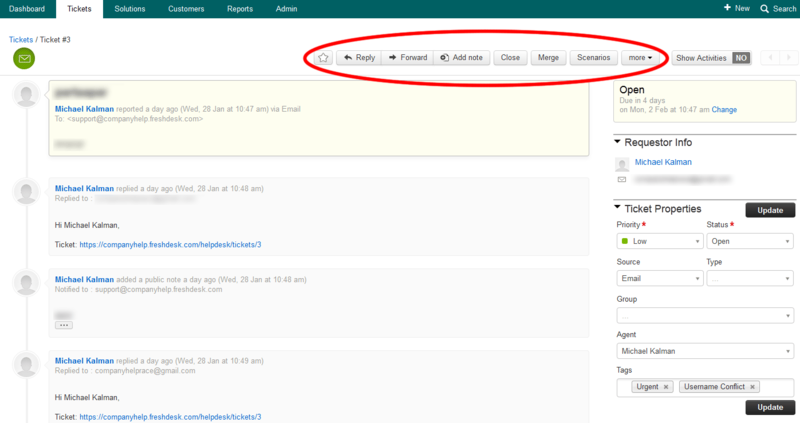 Includes collapsible replies, but the rows of buttons can be overwhelming. Pros: As the only enterprise-level support solution, Zoho Support ticks a lot of boxes when it comes to features, including a help desk, knowledge base and community. The selling point of Zoho is its unlimited requests and agents, which are really helpful to have as you grow. Zoho also offers simple SLA, ticket-to-article conversion and domain mapping. Cons: Zoho is hard to swallow, even after some time. Documentation is scarce and it’s frustrating to get various channels to work together. Even though I was able to populate my community in the admin panel, I was not able to locate the actual portal. In Short: It’s worth giving Zoho a try, especially since it looks quite good on paper. It may not be for every small business, however, considering the difficulty of managing multiple channels at once. Moving on to a brand new help desk isn’t a walk in the park. There’s email migration to take care of and endless settings to wade through. Worse still, that process needs to be done for every help desk vendor you’re considering. I hope that reading this article speeds up your search for a platform to take on a long-term spin. For more information on the customer service software industry and leading help desk solutions, check out Business-Software.com’s Customer Service Software Research Center. Vitaliy Verbenko is the guy behind customer service and marketing at Helprace. Vitaliy has been into customer service ever since he co-founded a small construction company five years ago. 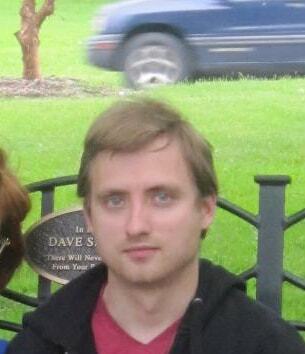 Vitaliy holds a BA from Canada's Ryerson University. Help Desk vs. Service Desk: What’s the Difference?